"I just tried to run my race and ended up squeezing out a victory so I just want to give thanks to the creator for giving me the strength and the endurance that I could have been able to push on through," said Farley who began challenging Stoby one mile into the 6.2 miles race. "I saw that he made several attempts (to break away) but I just managed to pick it up when I saw him coming, so I was able to make it through." Stoby congratulated Farley on running a steady race. "He ran a very good race and was steady in his pace and 39, I think this is the first time anyone has run under 40 on this course-it's a tough course bearing in mind the heat at well," said Stoby who finished in 39:38. "I have to give it to him. He came out very strong today. I tried to keep up hoping to hold on to the finish waiting to see what I had in the legs for a kick, but it didn't happen. I wasn't feeling so strong so I allowed him to set the pace and he went a little faster than I anticipated, so congratulations to Julius." Maria Mays won the women's division in 45:41. "It's the first 10K race I've done in ages so I'm delighted to be running it again and even more delighted to have won it," Mays said. 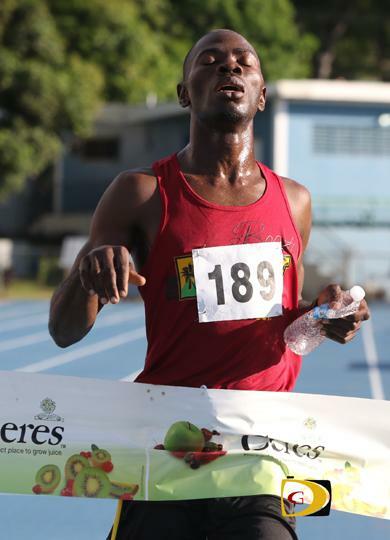 "I was really pleased with the Virgin Gorda 10Ks-I won both of those-and the Half Marathon, so I know that I was on reasonable form. But, you just never know." Final results: Men. 1. Julius Farley, 39 minutes and 24 seconds. 2. Reuben Stoby, 39:38. 3. Guy Williamson, 43:33. 4. Adrian Dale, 46:46. 5. Zebalon Mclean, 47:18. 6. Dan Mitchell, 47:35. 7. Guyp Dubois, 48:39. 8. Shane Donovan, 49:41. 9. Owen Walker, 51:41. 10. Charles Kerins, 52:33. 11. Aaron Gardner, 52:52. 12. Dennis Versoza, 53:55. 13. Simen Malmin, 54:29. 14. James Drury, 54:32. 15. William Hare, 55:48. 16. Claudius Rhymer, 56:12. 17. Gary Salter,57:28. 18. Sergio Dantas, 58:06. 19. Ruairi Bourke, 59:44. 20. Gabriel Obregon, 1:00:58. 21. Dennis Delacruz, 1:01:20. 22. Laurent Keeble-Buckle, 1:03:05. 23. Luke Plummer, 1:04:22. 24. Howard Moore, 1:07:26. 25. Nik Fox, 1:11:39. 26. Jim Cullimore, 1:16:45. Youth One Mile: Girls: 1. Z'Hara McLean, 12:19. 2. Ava Ghiorse, 12:50.